(DAYTON, Ohio)—Ohio Attorney General Mike DeWine, Montgomery County Sheriff Phil Plummer, and U.S. Department of Homeland Security Investigations Special Agent in Charge Steve Francis today announced the seizure of approximately 20 pounds of fentanyl with the capability of killing more than four million people. Authorities with the Miami Valley Bulk Smuggling Task Force, which is part of the Ohio Attorney General's Ohio Organized Crime Investigations Commission, seized the approximately 20 pounds of fentanyl last night. Authorities arrested the suspects after gathering evidence indicating they were allegedly involved in narcotics trafficking. As part of the investigation, agents conducted a series of traffic stops and searched a residence on Prentice Drive in New Carlisle, Ohio. A large amount of marijuana and more than $100,000 in cash were also seized as part of the investigation. "We are certain that this investigation has saved lives by stopping this poison from getting to the streets and into the hands of those fighting addiction," said Ohio Attorney General DeWine. "Each day, my office and law enforcement agencies across the state are fighting hard against the drug epidemic, and we must continue to press forward in the battle against the drug cartels." “This is another example of the ongoing battle against drug cartels bringing in illegal drugs into our communities. We recognize collaboration through federal, state and local partnerships are necessary to have a significant impact on the criminal organizations in Montgomery County and the Miami Valley,” said Montgomery County Sheriff Phil Plummer. Authorities with the Clark County Sheriff's Office assisted in the investigation. The suspects are currently being held in the Montgomery County Jail on drug trafficking charges. The Miami Valley Bulk Smuggling Task Force is made up of officers from the Montgomery County Sheriff's Office, Miami Township Police Department, Butler Township Police Department, Ohio State Highway Patrol, Montgomery County RANGE Task Force, Ohio Bureau of Criminal Investigation, Homeland Security Investigations, and Montgomery County Prosecutor's Office. 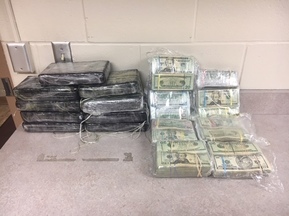 In addition to this week's drug seizure, the Miami Valley Bulk Smuggling Task Force has also seized 79 pounds of fentanyl, 122 pounds of heroin, 219 pounds of cocaine, 110 pounds of methamphetamine, 4,134 pounds of marijuana, and more than $7 million in U.S. currency since its inception 2013.